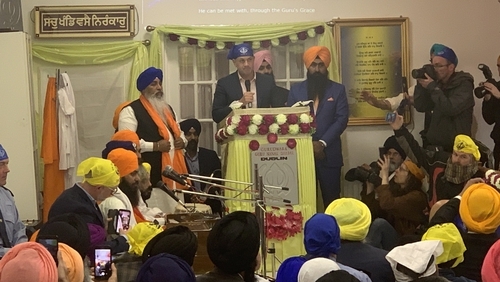 Taoiseach Leo Varadkar has attended a celebration in Dublin marking the Sikh religious festival of Vaisakhi. Celebrations for the traditional harvest festival mainly take place in northern India, but it is commemorated by Sikhs around the world, including in Ireland. Hindu and Muslim members of the Indian community also attended the event, which was held at the Sikh temple, or Gurdwara, in Ballsbridge. Vaisakhi marks the inauguration of the Khalsa, a term used for Sikhs who have been initiated into the faith. The first initiation ceremony - which is similar to a baptism - took place in 1699, and was initially established in opposition to religious oppression suffered by Sikhs in the 17th century. This year's festival falls a day after the centenary of the Amritsar massacre, when 379 Sikhs were killed by British troops. About 15,000 people had gathered in a public garden in the north western Indian city of Amritsar, when soldiers opened fire on the crowd. Earlier this week, British Prime Minister Theresa May described the massacre as a "shameful scar on British Indian history". But she has been criticised by Sikhs for falling short of making a full apology. The commemorations also coincide with the Christian observance of Palm Sunday.